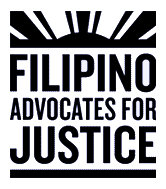 Come on home to celebrate Filipino Advocates for Justice’s (FAJ) milestone anniversary – 45 years of immigrant and low-wage workers rights, youth development, and community organizing. The current climate requires all 45 years of our community building and civic empowerment experience. In addition to resisting the racist and regressive direction of our national government, locally we are fighting for the ability of low and moderate income families to resist eviction and continue to live in their homes. It’s been 45 years of service, organizing and building the political power to manifest the community we deserve. In 1973, recent immigrants and young Filipinos founded FAJ (then FAA) to fight the discrimination, xenophobia, and racism our community faced. Incredibly, those issues are still at the forefront of our agenda. In the spirit of resistance and optimism, the event will highlight FAJ’s evolving civic engagement work as we defend and protect the most vulnerable among us. Catering by: Dominic Ainza, local award-winning chef and FAJ board member, will prepare reception-style offerings of delicious small bites and light fare. Please consider a sponsorship level to support FAJ’s efforts in this unprecedented moment challenging our democracy. Your donation arms FAJ with operational and organizing dollars to support front line activities and safe spaces for building community resilience. Your sponsorship comes at a critical moment as we prepare for a busy election year by developing youth, worker and immigrant leaders and volunteers to push back against the regressive policies harming our communities. Your donation helps us subsidize the attendance of community members, youth, and students. We greatly appreciate your past support, and look forward to hearing from you. For more information about sponsorship, please contact Judith Olais at (510) 465-9876 or visit www.filipinos4justice.org.